New trials by Nofima and CtrlAQUA show that large postsmolt don’t always reach slaughter size before small smolt. Photo: Terje Aamodt © Nofima. Project leader Trine Ytrestøyl. Photo: Terje Aamodt © Nofima. Researchers at CtrlAQUA are working on the basis of a hypothesis that an extended phase in recycling facilities on land will improve the fish’s growth and welfare in the sea. In addition, longer time in land facilities will result in a shorter production time in the sea, which is favourable in terms of reducing the risk of sea lice and escapes. 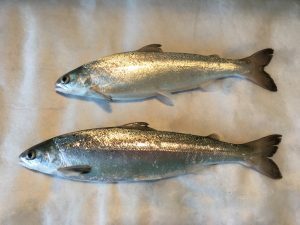 Researchers have previously shown that large smolt who have lived in good environmental conditions on land, have significantly lower mortality in the sea than fish who are transferred to the sea when small. The results of new trials with the transfer of fish of varying sizes to the sea show that biggest isn’t necessarily always best. 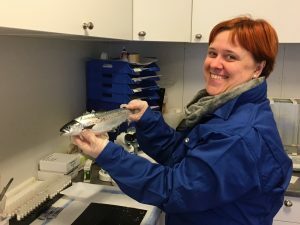 “The question is whether it is most important that the time the salmon spend in the sea is minimized, or whether overall production is as efficient as possible,” says Trine Ytrestøyl, project manager of the trials, which are carried out at CtrlAQUA SFI. The trial started with 30 gram salmon juveniles in tanks with recycled water at Nofima’s research facility in Sunndalsøra. The control group were smoltified by light control (winter signal) and were transferred to the sea as 100 gram smolt in August. The other groups were either exposed to 24-hour light for the entire land phase, or given a winter signal with a short day for 6 weeks as the control fish. Both light regimes were tested in both freshwater and brackish water, and the fish were transferred to the sea at around 200 grams in October or 600 grams in December. The fish were slaughtered at the end of November the following year, when they were around four and a half kilos. Salmon who had been exposed to light 24 hours a day in the land phase (below) were significantly larger upon transfer to sea than their siblings who were given a winter signal with 12 hours of light a day for six weeks (above). After more than a year in the sea, the fish that had been exposed to 24-hour light in recirculating facility were still slightly bigger. Photo: Trine Ytrestøyl © Nofima. If we return to the hypothesis, is it the case that an extended phase in recycling facilities on land will improve the fish’s growth and welfare in the sea? The most efficient production regime in the recycling facility was brackish water combined with 24-hour lighting for the entire land phase. The positive effect on growth by not giving the fish a winter signal was greatest when the fish were 200 grams, but still noticeable when transferring the 600 gram fish. The fish with the best overall growth through life were however the fish that were transferred to sea at 100 grams after undergoing traditional smoltification. The fish that were 600 grams at the time of transfer had the poorest growth. The latter ate little during the first three weeks in the sea, and had poorer growth in the summer. Although there were growth differences between the groups, all groups had good growth compared to the performance in commercial farming, with growth factors (TGC) between 2.9-3.3 in the sea phase. What was perhaps most surprising was that the fish in all of the production regimes endured the transfer to seawater, even though not all were smoltified in the traditional way by light control. Survival in the sea phase was 93%, and there were no differences between the groups. 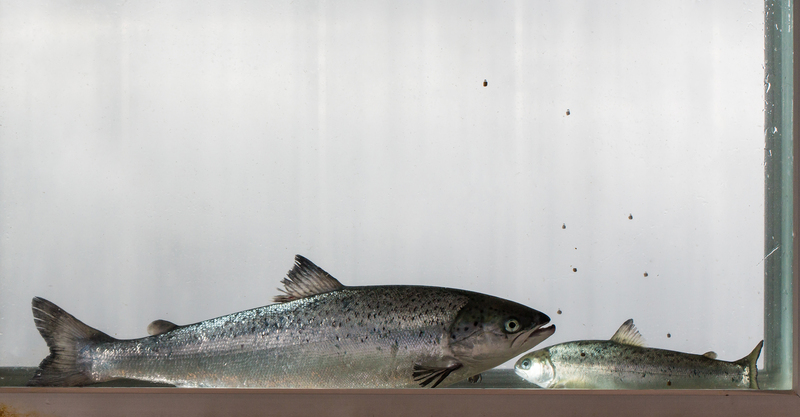 “It appears that salmon are quite flexible with regard to time of transfer to seawater, and this provides opportunities for several different production strategies,” Ytrestøyl says. The researchers’ conclusion is that several production strategies in recirculating facility may be used for the production of young salmon. The trial showed that the most effective production regimes in the recycling facility on land don’t necessarily result in the best growth in the sea phase. However, for a fish farmer, it may be of greatest importance to minimize the time in the sea. 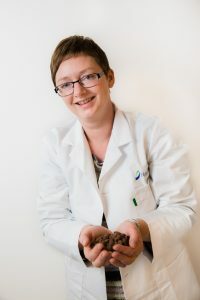 Researcher Jelena Kolarevic assesses different welfare parameters in one of the salmon that has spent a long time in a recycling facility on land. Photo: Trine Ytrestøyl © Nofima. It remains to be seen whether one would have achieved the same results if the fish had been transferred to sea in the spring with rising sea temperatures and longer days. Ytrestøyl nevertheless emphasizes that in order to reduce the risk of escape and sea lice, it is sensible to reduce the time the salmon spend in the sea, and these are important considerations. This illustrates that there are many unanswered questions with regard to how large postsmolt should be produced, and how the season at the time of transfer affects performance in the sea phase. Research will continue into these issues at CtrlAQUA. The objective of the trial was to evaluate the impact of various production regimes in recycling systems on growth, survival, health and welfare on land and in the sea phase. Trial design: Salmon were farmed up to 200 grams or 600 grams before transfer to sea, and were placed in fresh water and brackish water (12 ppt) respectively in full daylight for 24 hours a day. Some groups were given the winter signal for six weeks, with 12 hours of light and 12 hours of dark. The rest of the time in the recycling facility they were exposed to 24 hours of light. The control group was given a winter signal for 6 weeks, and was otherwise exposed to 24-hour light up to 100 grams. The project was partly funded by the Fishery and Aquaculture Industry Research Fund (FHF).